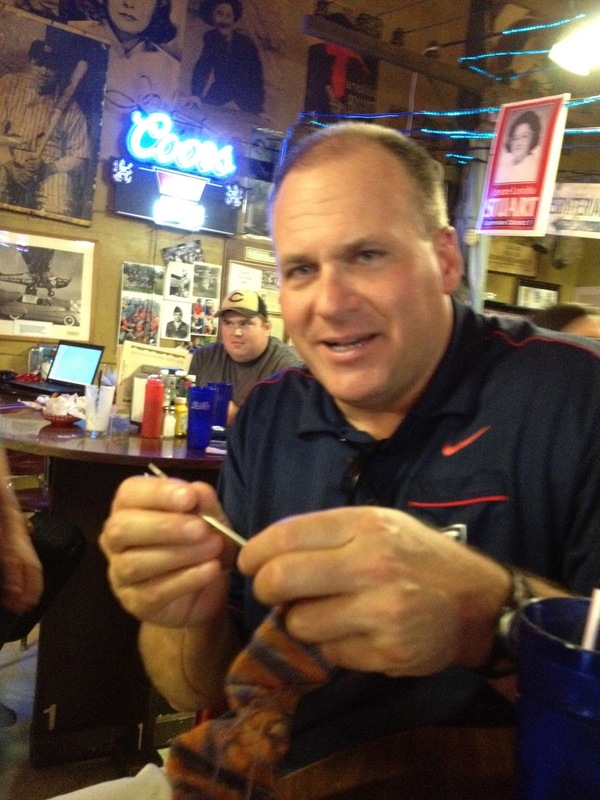 My Sock and the U of A Coaches! 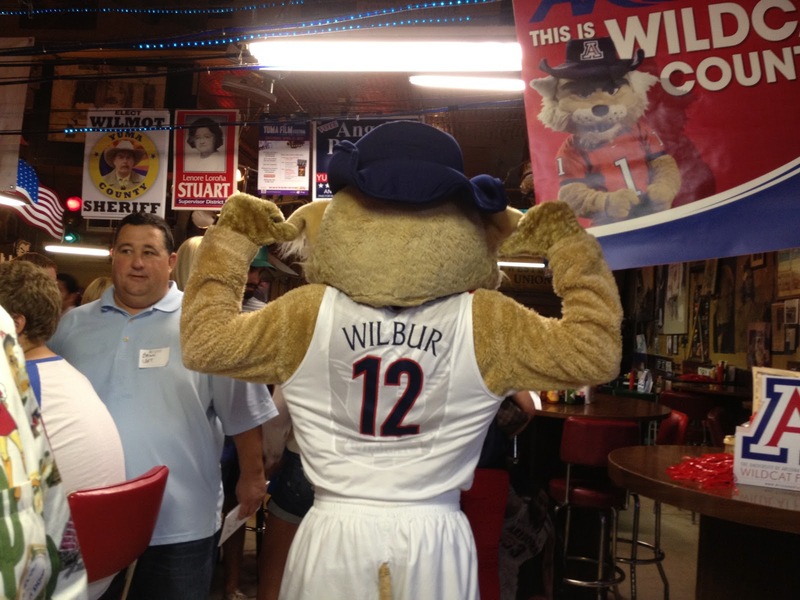 and Wilbur! OK, now I know that this doesn’t hold much importance for the jocks in the world, but I just took some superb pics of some of the University of Arizona coaches holding my sock. I know that it doesn’t seem like much of a big thing, unless you are a sockSock Knitter. And then of course, it is a big deal. There was a gathering tonight at Lute’s Casino hosted by the U of A Alumni to meet and greet the new Head Football Coach, the Men’s Basketball Coach, and the Women’s Basketball Coach and her Assistant.. We got there at 5:30 and the place was absoLutely (get it?) packed. I spotted an older couple quietly eating their burgers across the room, on the side by the Endurance Flight photo and they looked like they didn’t know what was going on, why the place was suddenly packed. I went over by their table and hovered at an adjacent table with some fellow Cibola people so I could snag the older couple’s table when they left. After a while, I put my knitting bag on one of the empty stools to stake out the table, with their permission of course. Of course I had my knitting. Why do you even ask? When the couple gave me the nod that they were leaving, I slithered off of my stool and onto the new one. Curt was socializing with some other people. One of the Women’s coaches sat down by me and said “I am mesmerized by your sock-that is a sock, right?” Which opened up the door for conversation. They had driven down today, some of the other coaches flew. She was glad that they had driven since it was windy outside. Then the emcee asked for everyone’s attention. He did a little intro for Niya Butts who is the Head Women’s Basketball Coach. She was really nice. Lisa Salgado is her Director of Operations and was the one I had been talking to. 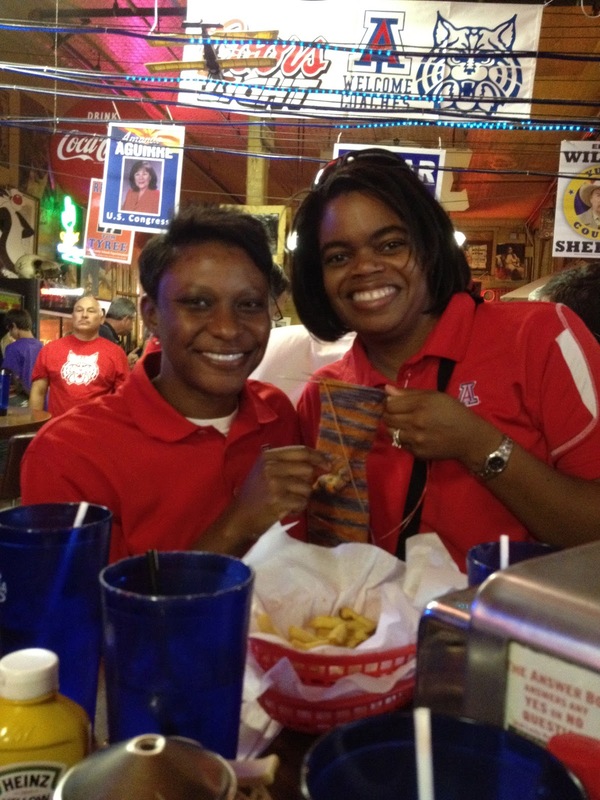 Here they are- Coach Butts on the left and Lisa on the right. They liked my sock. They have great smiles too. 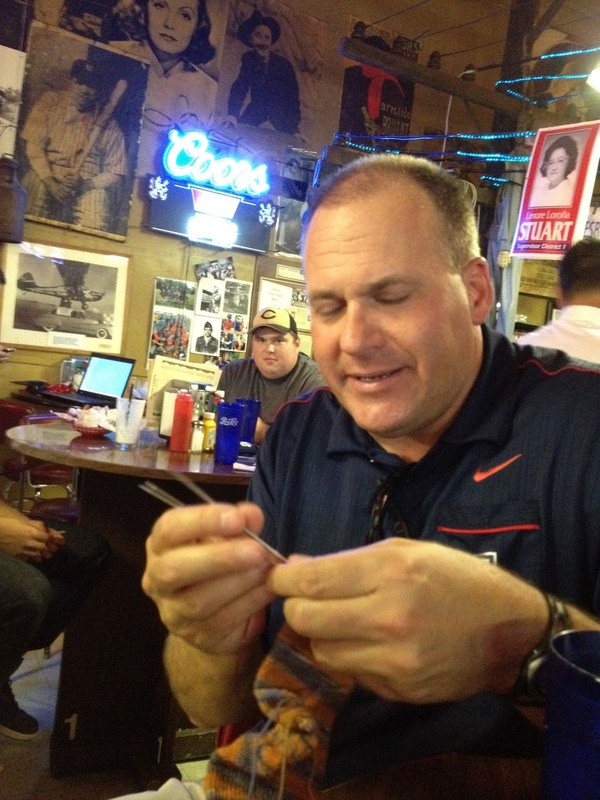 Then he said he wanted to look like he was really paying attention and getting into it— here is that photo. Next they introduced the Head Men’s Basketball Coach. 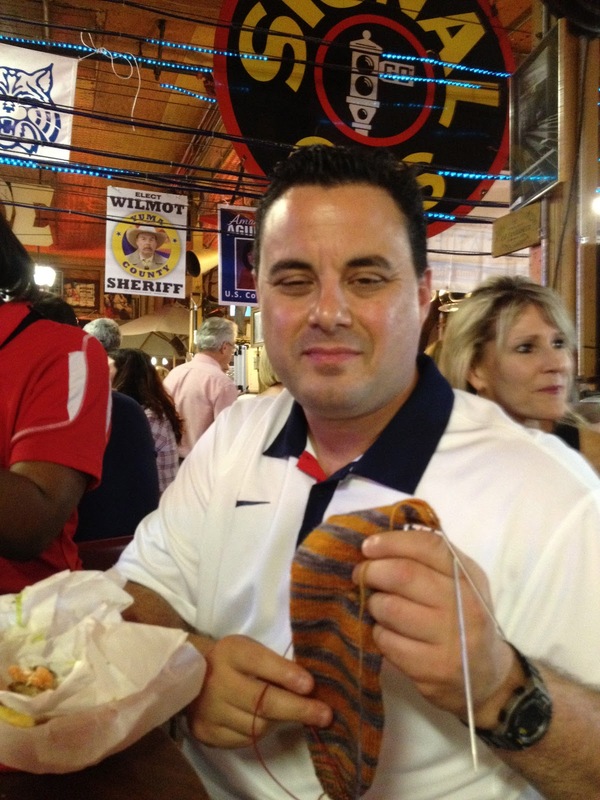 His name is Sean Miller. He sat down last. Here he is holding my sock. He wasn’t as into it as the other Coaches. Maybe I should have waited until he was done eating? 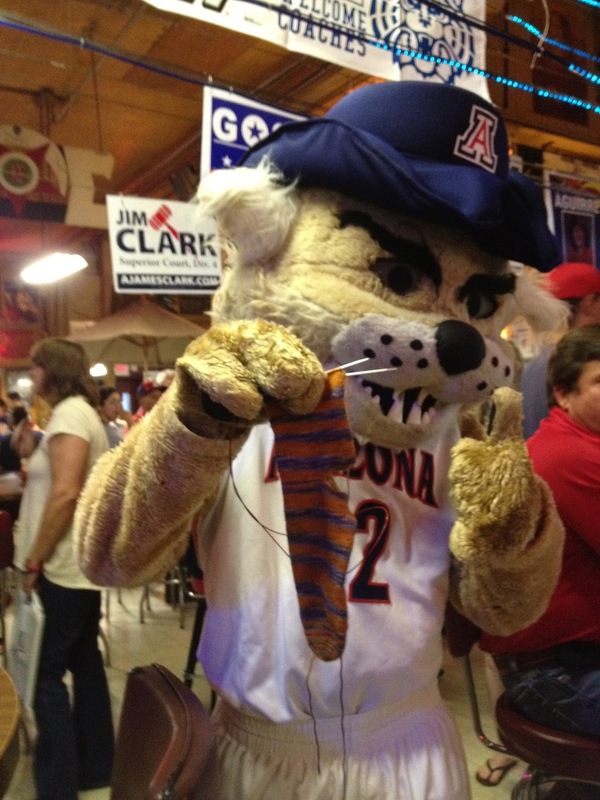 And no U of A gathering would be complete without Wilbur the Wildcat holding the sock. He looks pretty wicked up close. This is the first time I have ever asked anyone to hold my sock for a picture, I think. Definitely the first time I asked anyone of any notoriety to hold it. Not exactly like someone who is possibly going to be the most powerful man in the world. But nonetheless, plenty cool for this Knitter! They will probably forget 99% of the people they talked to tonight, including me, but I bet they don’t forget the sock. BTW, I think I am going to use Blogspot from now on. They have revamped it and it seems to have more options. Back to my sock!